Bestop started out making canvas tops for WWII Jeeps over 50 years ago, and today the company supplies OEM bikini tops to Jeep, Suzuki, Toyota, GM, Isuzu, and many other makers of light trucks. That same level of quality and factory-perfect fit is found in all Bestop Jeep tops, running boards, soft doors, Jeep seats, tonneau covers—every accessory Bestop makes! 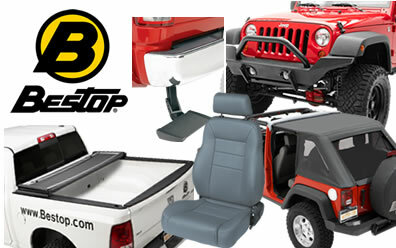 Find an extensive selection of Bestop products, including its popular Trektop NX and Supertop NX soft tops, Bikini Tops, and Safari Tops, in stock and ready to ship at Summit Racing. Shop now! Buy a Bestop Bikini Top and get a free Windshield Channel!